An extremely explosive volcanic eruption on the Italian peninsula 39,000 years ago is the subject of a new study by professor Michael Ort of Northern Arizona University’s School of Earth and Sustainability. The National Science Foundation recently awarded Ort $290,000 for the three-year project. Through careful fieldwork and advanced geochemical analysis, Ort will unlock the secrets of the Campanian Ignimbrite super-eruption. Ort, who’s been studying this volcanic event for years, believes it may show why some eruptions are so explosive. “It was the largest eruption in at least the past few hundred thousand years in Europe and was perhaps several hundred times bigger than the Mount St. Helens eruption in 1980,” Ort said. From a volcanic vent in what is now Naples, ash spread far to the east. The explosion left its signature all over the eastern Mediterranean and eastern Europe—even as far away as Moscow. “Many archaeologists think the eruption delayed the migration of modern humans, allowing Neanderthals to last a bit longer in Spain,” Ort said. Two characteristics of this particular volcanic event fascinate Ort, who specializes in understanding pyroclastic currents—fast-moving currents of hot gas and volcanic matter—and magmatic processes in the Earth’s crust, such as melting and crystallization. The swift-moving current of molten rock lost material as it raced along, eventually becoming lighter than air. That sent it shooting skyward. What caused the current to super-expand? Ort is collaborating with scientists at the University of Oxford in Britain and Italy’s Università di Roma Tre and Osservatorio Vesuviano to figure out the source of the gas that enabled these unusual behaviors. The scientists have completed their initial field work and sample collection. Later this year, they will start testing analysis methods. The main field campaign will follow in spring 2019. Even at this stage, however, the results are intriguing. 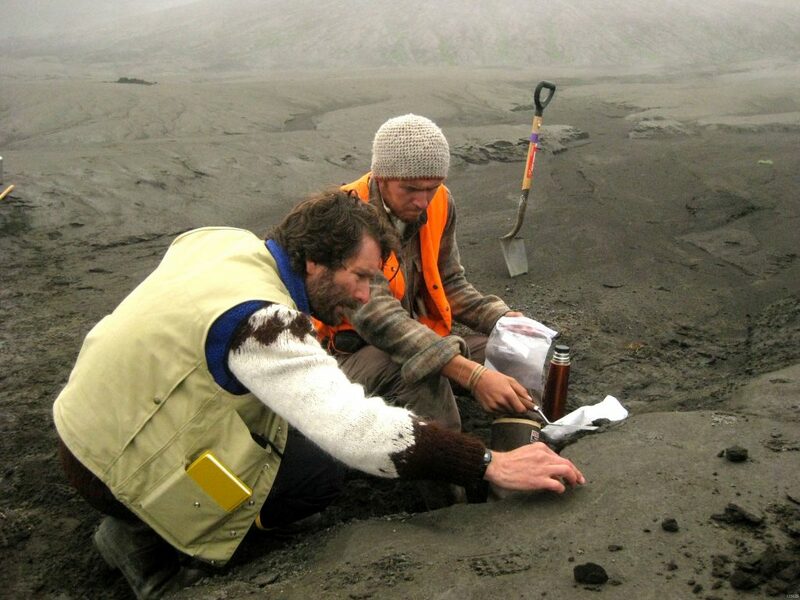 “Within the ignimbrite rock emplaced by the volcano, we’re finding many different types of magma (present as pumice chunks now) that seem to be from different periods during the eruption,” Ort said. The team will map those periods and assess tiny “melt inclusions” in crystals to find out how much water, carbon dioxide and other gases were present at each stage of crystallization. To Ort, the point of this project is not just to understand what happened during one particular eruption 39,000 years ago. At NAU, Ort’s primary research focus is on volcanoes, including eruption and emplacement processes, petrology, geochemistry and the interactions of humans with volcanoes. His research into eruption and emplacement processes of pyroclastic flows and surges has focused on large-volume ignimbrites in Argentina and Italy and on maar and scoria-cone volcanoes in Arizona—including the San Francisco Peaks—as well as in Alaska and Mexico.